Vermillion red torii gateways are a famous feature of Inari shrines, and the color evokes a strong sense of spirituality for Japanese people. The torii gateways of Inari shrines are painted by the same Inari-nuri technique as the building. The Japanese word for “vermilion”, ake, can be written in various different characters, each with a different meaning. In addition to its meaning as a shade of red, the word can also refer to red in general, dawn and light. These meanings convey a sense of brightness and hope, and the color is associated with a strong belief in the soul of Inari Okami and blessings for life, the earth and production. 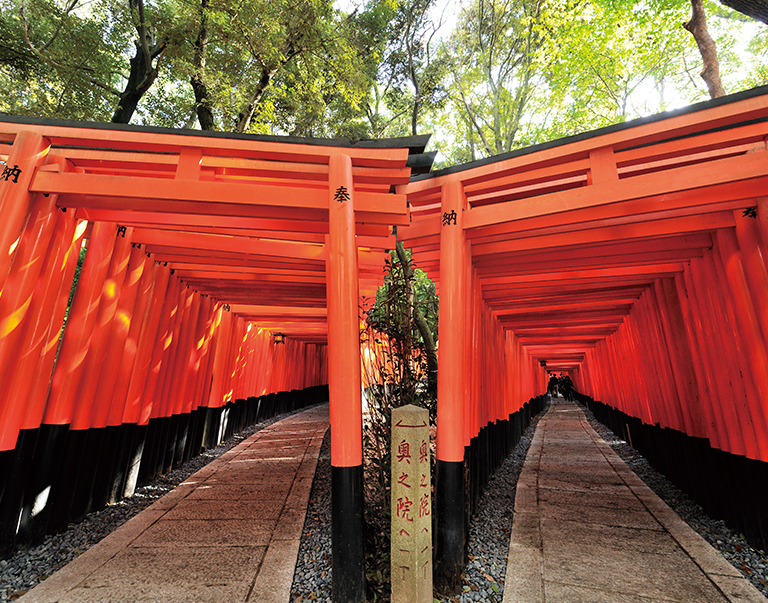 Worshipers have donated torii gates to express prayers and appreciation since the Edo period (1603-1868), and Fushimi Inari Taisha is now famous for its Senbon Torii “Thousand Torii” gateways.